Opioids are the mainstay of treatment strategies to reduce pain, but withdrawal can be a serious problem when patients stop taking these drugs. However, beyond the recognition that microglia play a role in this phenomenon, little is known about the cellular mechanisms involved. Now, new research shows how microglia contribute to withdrawal in rodents and identifies a potential path toward easing withdrawal in patients. Using a rodent model of morphine withdrawal, a team led by Tuan Trang, University of Calgary, Alberta, Canada, demonstrates that chronic morphine exposure in rodents increases the expression and activity of pannexin-1 (Panx1), a pore-forming channel on the cell surface of microglia that releases ATP. They find that Panx1 function is increased even further during naloxone-induced withdrawal and that inhibition of the channel with two clinically available drugs reduces withdrawal behaviors, providing the opportunity for immediate therapeutic translation. “It’s a really nice paper. We’ve known for a while that the immune system contributes to opioid withdrawal, but this paper is the first to investigate the underlying cellular mechanisms,” says Peter Grace, University of Texas MD Anderson Cancer Center, Houston, US, who was not involved in the study. The work was published online January 30 in Nature Medicine, along with an accompanying News and Views that also commented on recent research on mechanisms of morphine tolerance and hyperalgesia (see PRF related news story; Puig and Gutstein, 2017). Microglia are known as the immune cells of the central nervous system. For reasons unknown, exposure to morphine sends them into an active state. Mounting evidence suggests that microglia play a significant role in many of the side effects of opioids including tolerance, opioid-induced hyperalgesia, and withdrawal—all of which contribute to morphine’s addictive nature (see PRF related news stories here and here). “We know that there’s a whole body of evidence that says microglia respond to opioids, so Nicole Burma [first author on the study] spearheaded the project to ask what the role of microglia might be in withdrawal,” said Trang. Burma turned to a rodent model of opioid withdrawal where animals are treated systemically with morphine twice a day for five days to induce morphine dependence, followed by a dose of naloxone, a morphine antagonist. The injection of naloxone leads to an abrupt cessation of morphine signaling that sends the animals into a state of withdrawal. “Some of the symptoms we look for are headshakes, wet-dog shakes, teeth-chattering, increased grooming, piloerection, allodynia, and salivation,” said Burma. Burma first performed a loss-of-function experiment by targeting saporin, an immunotoxin, to microglia in the spinal cord to ablate them. This left morphine analgesia intact but reduced naloxone-induced withdrawal behaviors. This is consistent with studies showing that other undesirable side effects of opioids, including tolerance and opioid-induced hyperalgesia, can be targeted while leaving their beneficial analgesic properties intact (Wang et al., 2012; Corder et al., 2017; see PRF related news story). To further examine the microglial contribution to withdrawal, the researchers examined spinal cord homogenates from morphine-treated and control rats using flow cytometry. In morphine-treated animals, they found increased expression of Panx1 channels in cells expressing the microglial marker CD11b, compared to control animals, whereas this change was absent in CD11b-negative cells including neurons and astrocytes. Not only were there more Panx1 channels, but their activity was also enhanced in CD11b-positive cells from animals treated with morphine. The team saw a further increase in channel activity when naloxone was administered. To show that Panx1 channels played a critical role in naloxone-induced withdrawal, Burma administered a Panx1 channel blocker to morphine-treated rats one hour prior to naloxone injection. Strikingly, it worked; withdrawal behaviors were significantly reduced. “This provided an approximation of how microglia might be involved in withdrawal, which then allowed us to go in with more refined tools,” said Trang. What are Panx1 channels doing? Switching from rats to mice to use more precise genetic tools, Burma generated a transgenic mouse line where Panx1 channels are deleted only in microglia. She found that morphine still retained its analgesic capabilities in this model, but upon naloxone challenge, withdrawal behaviors were once again significantly reduced. To understand Panx1’s functional contribution to withdrawal, the researchers used a whole-lumbar spinal cord preparation with intact dorsal roots made from the transgenic mice lacking Panx1 in microglia or from normal mice following five days of morphine or saline treatment. This allowed the researchers to electrically stimulate the dorsal root while recording postsynaptic field potentials (fPSPs) from spinal cord neurons that receive nociceptor input. Bathing the preparations from normal mice with naloxone induced a slow-rising facilitation of fPSPs that lasted for an hour. In microglial Panx1-deficient mice, however, there was silence; naloxone had no effect on these electrical signals. The team then sought the molecular basis underlying the contribution of Panx1 to morphine withdrawal. They found that a receptor critical for the opening of Panx1, the ATP-gated P2X7 receptor, was upregulated in microglia after morphine treatment, and that inhibition of the receptor decreased naloxone-induced withdrawal. They then examined the contribution of ATP to morphine withdrawal, since Panx1 activation leads to ATP release. Bathing naloxone across spinal cord sections from normal mice that were treated for five days with morphine caused the release of ATP. 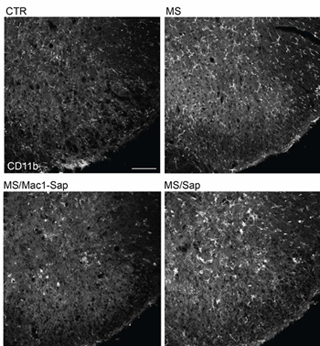 This effect was significantly diminished in spinal cord sections from mice lacking Panx1 in microglia, demonstrating the need for microglial Panx1 channels in naloxone-induced ATP release. Furthermore, they found that the intensity of naloxone-induced withdrawal could be regulated by modulating ATP levels in the spinal cord using various pharmacological techniques, with higher ATP levels associated with greater withdrawal symptoms. Together, the study’s findings highlight a pathway during naloxone-induced morphine withdrawal where enhanced activation of P2X7 receptors on microglia leads to opening of Panx1 channels and release of ATP. What molecules ATP then acts on, however, is still a mystery. “That’s something we’re trying to figure out, because there’s a whole family of receptors that ATP and its metabolites activate,” says Trang. The results also presented Burma and colleagues with an intriguing opportunity, since there are already two drugs used in the clinic that inhibit Panx1 channels: probenecid, an anti-gout medication, and mefloquine, an antimalarial drug. They tested whether these treatments could reduce withdrawal symptoms and found that administering either drug one hour before naloxone challenge significantly reduced withdrawal scores in morphine-treated rats. Further demonstrating the utility of targeting Panx1 channels, probenecid also reduced withdrawal behaviors in mice treated with fentanyl, another common opioid, as well as in a spontaneous morphine withdrawal model that does not rely on naloxone. “We are working to pursue human trials right now in conjunction with the Calgary Pain Clinic,” says Trang. Meanwhile, there is still work to be done to fully understand the microglial contribution to withdrawal. “The gap here is really how Panx1 channels are preferentially upregulated in microglia following chronic morphine treatment. That’s something they don’t really speculate on, but it could be key. This could be a potential direction for future research,” said Grace. Nat Med. 2017 Mar; 23(3):355-360. Blockade of PDGFR-β activation eliminates morphine analgesic tolerance.